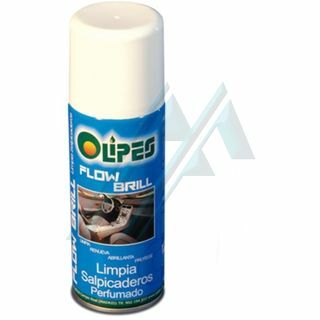 Flow Brill is a cleaner-Polish dashboard spray aspect is not greasy to prevent the adhesion of dust on the dashboard and to avoid the reflections of the sunlight and glare. product and/or in the material safety data sheet. .
Flow Brill cleans, renews, brightens and protects dashboards, skay, plastic seats, leather, roof, and vinyl components, door skins, glove compartment, bumper, etc, restoring its original appearance and to revitalize the plastics materials damaged by the action of the solar rays by giving them a nice texture. Flow Brill prevents the adhesion of dust, thanks to its formula free of oils, thereby providing a greater length of the cleaning of the interior of the vehicle. Flow Brill is pleasantly scented. Applied on the body, Flow Brill repair the superficial scratches of the car and removes stains of oil, grease and tar without damaging the paint. Product in spray specially designed to brighten and renew surfaces. - Revitalizes the plastic materials damaged by the action of the solar rays, lending a nice touch and texture. - Prevents the adhesion of dust to the surface, bringing with it a greater duration of the cleaning of the interior of the vehicle. - Applied on the body repairs scratches surface and removes stains of oil, grease and tar without damaging the paint. - Pleasant smell, perfuming gently the interior of the vehicle. Applied discontinuously with spray short and at a distance of 20-30 cms from the surface to abrllantar. Distribute the product evenly with a clean cloth, getting instantly a buffing perfect. PRESENTATION: Spray of 520 cc.